Mason jars are for more than just canning and storing food—from diffusers to terrariums, you can do so much more! 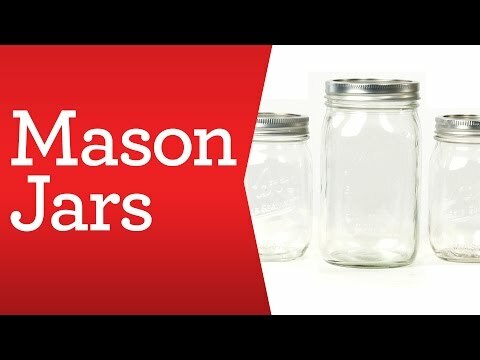 Perfect for canning, crafting, storage, decorative use and art projects, there are a million things you can do with these Mason jars. A great storage alternative, you can keep all of your loose craft or office supplies neat and organized in these clear glass jars, or use them as a creative and decorative way to display bath salts, cotton balls and other toiletries. Kerr® Mason Pint Jar is rated 4.8 out of 5 by 60. Rated 5 out of 5 by Kaitycat from Bought it for a craft project This is a cute little mason Jar, I bought it to make a snow man mason jar and it turned out beautifully. I might buy more of these for more craft projects! Rated 5 out of 5 by beckykimber from Kerr mason jar I decorated the jar with paint to make a snow man. The nose and hat was made of cardboard and a pom pom was placed on top. The eyes are buttons. Its cute. I want too put candy in it and give it away as a gift. The jar is sturdy. Rated 5 out of 5 by Isabelina from Great product for coffee bar I used these to add condiments for coffee bar. I used one for sugar tea bags and another for creamer. Rated 5 out of 5 by Babydoll23 from This Mason jar did the job! :) The Mason jars I bought brought lots of Joy during Christmas with the filled chocolates! Rated 5 out of 5 by NoankWaters from Used for Liquid Hand Soap Used for homemade hand soap. Everyone love their gift! Rated 4 out of 5 by Dot57 from This jar is handy. This jar is perfect for my Christmas gift project which is I place 5 homemade chocalate covered dipped cookies( christmas colors) in each jar and top it with a Christmas bow. The only problem is the work it takes to remove the scan label that is positioned on the jars top. It is so hard to remove those labels. Any tips? Rated 4 out of 5 by Nana King from Love it! On trend, yes. But what I love is that you can SEE how much product is left.